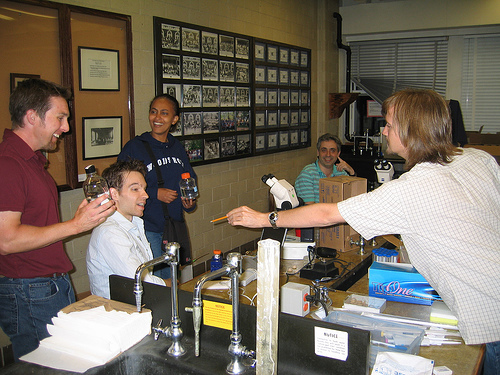 As I mentioned in a previous post, I was lucky to be able to attend, as a student, the 2006 Molecular Biology of Aging summer course at the Woods Hole Marine Biology Laboratory. This three week course was intensive; part the time was spent in lectures, where many of the world’s leading experts on aging explained their research in detail (and the students were able to ask lots of questions), and the rest was spent in the lab. There was also often time to attend some of the many other stimulating talks in molecular biology or neuroscience being held elsewhere at Woods Hole. Because the subject was so far from my normal research, I took vacation time to attend; I suppose it doesn’t seem like much of a vacation, but in fact Woods Hole is incredibly stimulating, and it was one of the most memorable and refreshing vacations I’ve ever had. We performed real experiments in the lab, as the other students were all biology post-docs and grad students who were there to learn cutting edge techniques. I was also assigned to a group, led by Dr. Meng Wang, a post-doc in Gary Ruvkun’s lab, and we learned how to perform RNA interference (RNAi) screens on the nematode worm C. Elegans. The RNAi technique lets you suppress the transcription of any single gene in the worm’s genome. An “RNAi screen” means that you divide the population of worms that into groups organized so that each group has a different gene suppressed, and you make sure that you have a group for each gene in the genome. For each group of worms, you check whether it has some phenotype that you’re interested in (in our case it was the ability to breed at a later age than usual). That way, you can quickly find genes that are involved in the phenotype. The picture above is from the lab at Woods Hole. From left to right are Michael Morissette, Andrew Midzak, Serkalem Tadesse, myself, and John Cumbers. The others have finished their work, but I was slower than everybody else, so I’m guessing that I was still counting worms or something. Another protocol was for “picking” worms (moving them from one petri dish to another). An adult C. Elegans is only about 1 millimeter long, so picking them up is not easy. You do it under a microscope with a special thin wire (a “picker”). You sort of try to scoop them up, but the worms run away! It’s like a video game, except not nearly as fun, really. Here’s a video showing the technique in action. You should notice by the way that the picked worm is glowing. That’s because the worm is a mutant: a gene for a fluorescent protein has been spliced into its genome attached to another gene (daf-12) of interest. That way you can know where daf-12 is expressed in its body. (This video was submitted by user a99xel to YouTube). This entry was posted on September 1, 2007 at 12:44 pm and is filed under Aging, Biology, Science, Technology, Video. You can follow any responses to this entry through the RSS 2.0 feed. You can leave a response, or trackback from your own site.